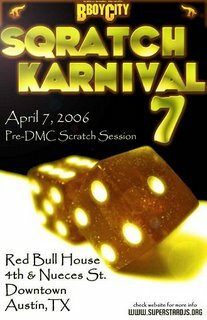 Another Sqratch Karnival! This one will be special since it's right before the DMC Regional and it should get you hyped up for the event! And it's at the Red Bull House for the first time which is a tight joint! AND it looks like it's in conjunction with BBoy City no doubt part of the BBoy City 13 festivities! Get ready for some breakin and scratchin!